A new Link web part has been added to the Team sites. With this web part you can add a link (website) to a page to create a link that displays information about the linked page. 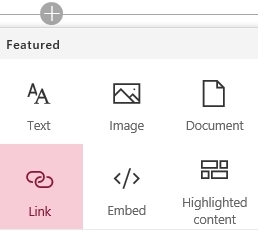 The web part will create a clickabe tile that contains a title, description and a picture if possible of the linked page. The look and feel is the same as linking a web page in Slack or WhatsApp. Provide the web part with a hyperlink and press enter. The web part will resolve the hyperlink and show some information of the website.